Lovely small houses with private pool and wide garden. 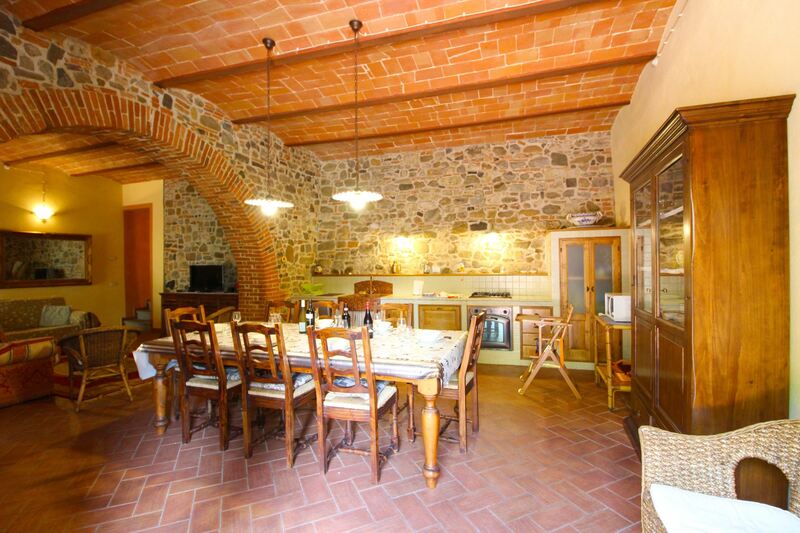 Among the Val d'Ambra hills, dominated by the Cennina Castle the ancient bulwark erected to its protection, plunged into the country peace and quietness, there are two lovely small houses (la Casina and La Veranda) available to our guests. Surrounded by a wide, completely fenced and well-kept garden, equipped with outdoor furniture, barbecue and 2 bicycles, shaded by tall pines and adorned with flowers. The house is ideal to those who wish to spend their holiday into the green. The beautiful swimming pool (m. 6x11, depth m. 1,30-1,90), for the guests exclusive use, is situated in front of the house La Casina. Furnishing is valuable and guarantee a good level of comfort. Strategic location for visiting the major centers of Tuscany. 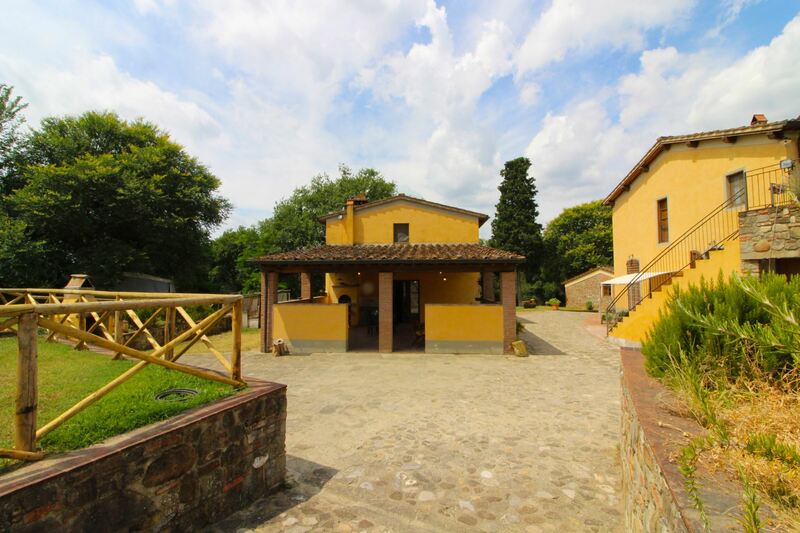 The village of Bucine, 1 km far, is in a walking distance and endowed with shops and services, a little further Levane, Montevarchi and San Giovanni Valdarno. The cities of Firenze, Siena and Arezzo all reachable in less than 1 hour driving. On request it is possible to organize typical Tuscan dinners on site. LA CASINA: Small single house on one level situated in front of the swimming pool, composed of living-dining room with kitchen corner and fireplace double bedroom with added single bed and bathroom with shower. LA VERANDA: Small house with large portico equipped with table and chairs for eating out in the open. 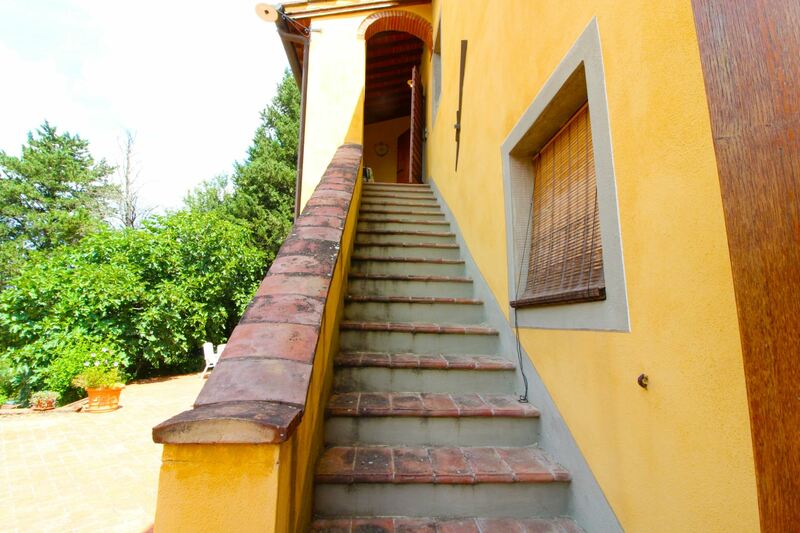 Going up a few steps you enter the sitting-dining room with kitchenette, wood stove and sofa, bathroom with shower. A wooden staircase leads up to a mezzanine with a double bed. EQUIPMENT: Satellite TV, washing machine, fridge, freezer, oven, microwave, toaster, filter coffee maker, iron and ironing board, Wi-Fi Internet access, complimentary toiletries, moka coffee maker, hair drier, lemon squeezer. Property cleaned and supplied with sheets and bathroom towels with weekly change. Heating Euro 0,50 per kwh (if used).